When leaving a foreign posting, Britain's ambassadors were encouraged to write a valedictory despatch until the practice was abolished in 2006. 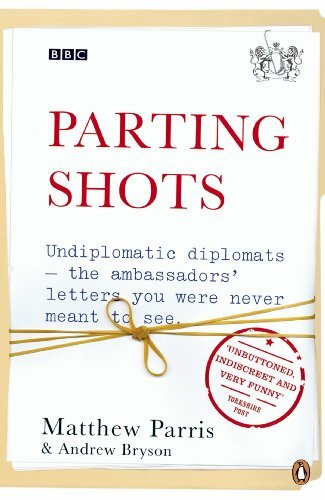 Unlike the usual style of the diplomatic bag, these last reports from foreign posts were unbuttoned, indiscreet and often very funny. There was much settling of scores, some poking fun of foreigners, a degree of moaning about the privations of Embassy life - and sometimes a bit of serious analysis too. 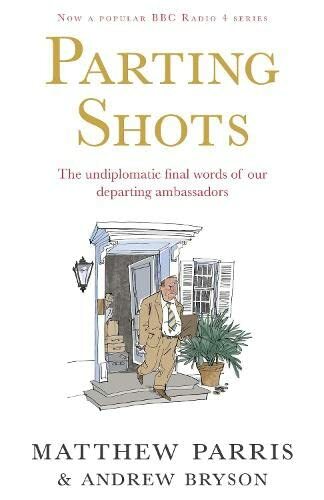 Based on a very successful BBC radio series, Matthew Parris, who once worked for the Foreign Office and had the task of distributing the despatches, and Andrew Bryson have compiled an always entertaining and frequently hilarious volume of the best of them. Andrew Bryson is a radio journalist working in the BBC's Business and Economics Unit. He set about making Parting Shots for BBC Radio 4, after reading a column by Matthew Parris about valedictory despatches in The Times. As well as producing the series, Andrew researched the material - a contrast to his day job behind the scenes as a producer on BBC Radio 4's Today programme and Radio 5 Live, and occasionally in front of the microphone. Matthew Parris is a columnist for The Times for whom he was previously a parliamentary sketchwriter. He was a Conservative MP from 1979 until 1986, and once worked for the Foreign Office. He says that it was after reading one of these valedictory addresses that he decided to give up his career there. His highly acclaimed autobiography Chance Witness was published by Penguin.